This entry was written by whyevolutionistrue and posted on April 14, 2019 at 12:30 pm and filed under ducks. Bookmark the permalink. Follow any comments here with the RSS feed for this post. Post a comment or leave a trackback: Trackback URL. Maybe ducks don’t like flying in the snow and they happen to all be drakes because the hens are sitting on eggs. ??? Maybe water is freezing over somewhere nearby? Could the interlopers be previous offspring of Honey? Good question. Last year I was wondering what would happen if the offspring returned to the small pond. I imagine though, that they will have to slug it out with the rest of them. I was wondering the same thing, and if the professor would have a whole passel of peckers to care for. Snow. Fighting ducks. There is nothing like a spring day in Chicago. If you want ducks, just add water. Not likely given that it’s been warm and nothing is frozen over right now, not in the area. I think they were hatched there! last year’s ducklings. Indeed, I wonder if being fed as ducklings reinforced the association & has stopped them dispersing? But if that were the case, where are the females? I always thought there were several drakes for every duck I saw… is there higher mortality of females? I cannot see why there might be – I would expect higher male mortality as they are more easy to see…! Interesting! 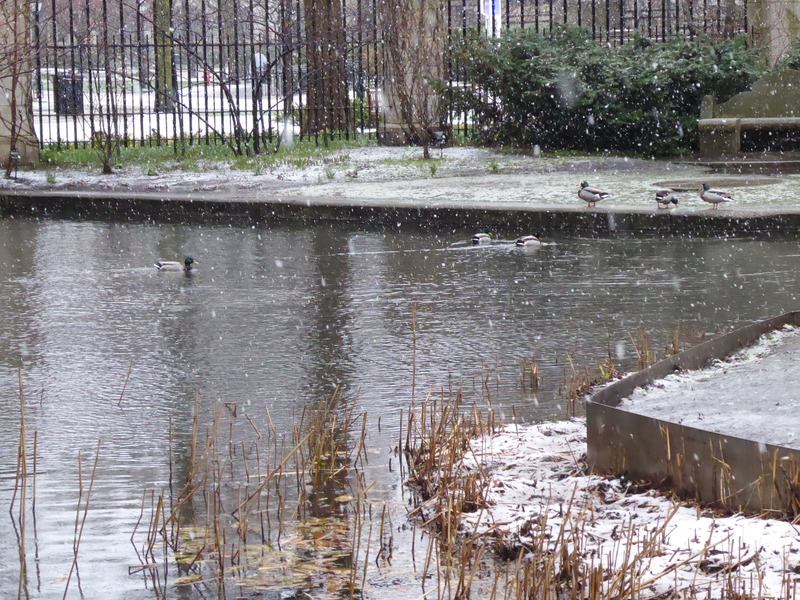 Ah but did the snow bring the ducks or did the ducks bring the snow? And I said they were evolving into a social species. 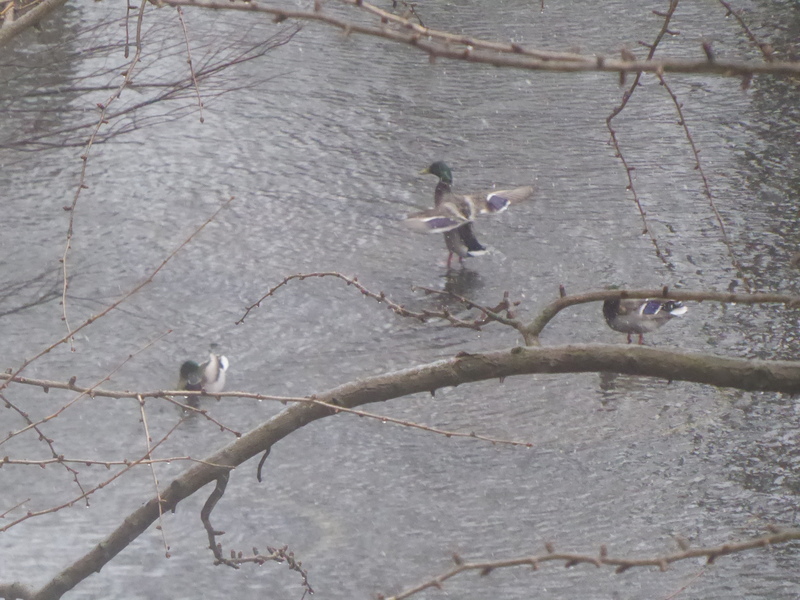 I think these ducks just landed. They come from away. Nice to see and hear good news once in a while. For another bit of cheer, it is being reported that there has been three new calves of the North Atlantic Right Whale, Eubalaena glacialis, spotted off the New England coast. Last year there were none, and with only 450 or so left, every calf counts! Thanks for posting this heartwarming video! You’re gonna need a bigger boat more duck names. The great winger Frans Peckenpower. The tennis playing duck Boris Pecker (on second thoughts, perhaps not). You may want to get ready to avert your eyes. Things can get – well, interesting in the duck world! Maybe their “womenfolk” were all sitting on eggs, and they were bored and lonely and looking for something to do.